This is the statue of the mother duck and her ducklings in the Boston Public Garden. The statue is based on the Robert McCloskey book, Make Way for Ducklings. 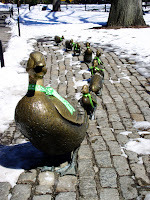 You'll notice that the ducks have been outfitted with green ribbons in honor of St. Patrick's Day, which is celebrated on March 17th and is a great day for the Irish in Boston. I like the way the snow seems to part for the infamous ducks.